Hello to all and Happy 2010! I can't believe how time flies, or at least how long it takes to get back into the rhythm of things. I am proud to say that I now have a 'studio' space (a wonderful makeshift area created by my wonderful husband). I have several pieces in the works, however not far enough along to take pictures. Tonight I am posting a small piece that I created from a scrap paper thrown away by a student. (It had a stick figure with big eyes and mouth right in the middle.) 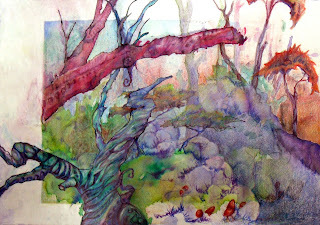 The reclaimed paper was later used as a watercolor demo by Nick and then by me, without erasing the pencil lines. Today I started layering on prismacolor details to prove a point to a student. You can make a complete, wonderful art piece out of something you thought was ruined. I think I proved my point! Other post will follow shortly. I like this one alot. This is a great style and marketable, I think.